Rescuers on Thursday resumed a search operation despite inclement weather near the Tibet border with Himachal Pradesh where a snow avalanche killed a soldier while five more have gone missing. As the efforts entered the second day, the authorities suspected that the soldiers might be trapped in the snow pile spread over a 200 square metre area. "This morning the search operation began despite intermittent snowfall," a government official told IANS. He said Wednesday night there were reports of another glacier receding in Pooh. But there has been no loss to life. 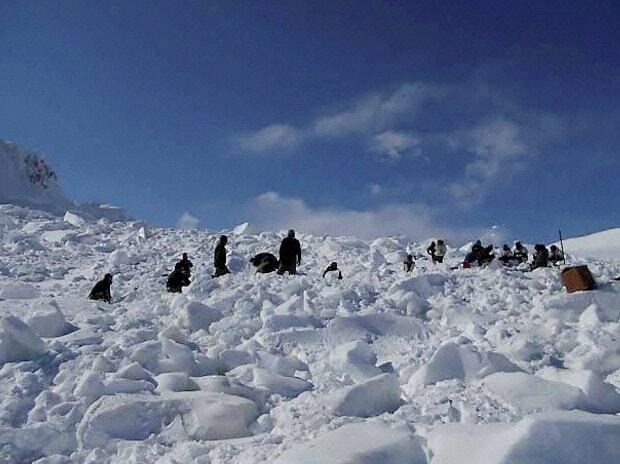 The avalanche on Wednesday triggered when the glacier near Namgia Dogri bordering Tibet slid, burying six soldiers of the Jammu and Kashmir Rifles while 16 of them were on a routine patrol. Five Indo-Tibetan Border Force (ITBP) troopers were also injured in the disaster. The government said two separate parties of the Army and the ITBP were patrolling at Namgia Dogri when the avalanche hit. The soldier who died has been identified as Rajesh Kumar, 41, belonging to Himachal Pradesh. The disaster spot, which is some 350 km from the state capital, has been witnessing heavy snowfall over the past few days. Himachal Pradesh is likely to receive moderate to heavy rain and snowfall in the next 24 hours till Friday, a weather official in Shimla said.